Yo no se nada de usted, pero tuve su folleto que no es fiesta de todos los días. Por los mundos que vienen en él, por la densidad y a la vez ligereza de su espíritu, por lo muy novedoso y atrapador. ... and bought a home at 729 East Anapamu Street, across from Santa Barbara High School. She came here primarily for diabetes treatment at the internationally known Sansum Clinic. Although she stayed here only a short time, she developed a great affection for the city. Shortly thereafter she moved to the remote reaches of southern Chile, where she continued to teach and where she wrote her first two published books of poetry: The first concerned lost love; the second was a collection of children’s poems. Her first book was published with the help of a professor at Columbia University, who had taught Mistral’s verse to an enthusiastic response. Her chosen pen name reflected her deep Christian faith and her love of nature. Mistral was also a champion of education, a social activist, and a journalist. In the mid 1920s, she moved to Mexico, where she promoted a series of educational reforms. For a short time, she taught as a visiting professor at Barnard and Vassar colleges in New York State. She then moved to Europe for 17 years, where she would serve as Chilean consul in both Spain and Portugal. 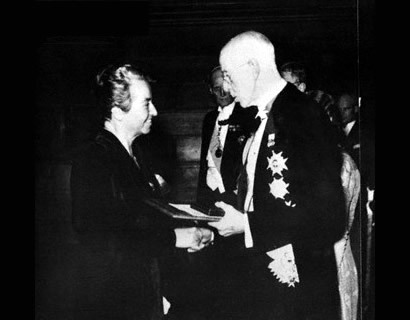 A great believer in international cooperation, she headed a committee of the League of Nations in the 1930s dedicated to promoting worldwide understanding. She donated the royalties of her third book of poems to aid children victimized by the ravages of the Spanish Civil War. During her decades of globe trotting, she made friends of such luminaries as writers Aldous Huxley and Thomas Mann, scientist Marie Curie, and U.S. first lady Eleanor Roosevelt. After the Second World War, she worked with the United Nations and helped establish UNICEF. One year after becoming the fourth woman to win a Nobel Prize of any kind, and the first Latin American to win the Literature prize, she purchased her Santa Barbara home for just more than $20,000. From time to time, she would lecture at the University of California, Santa Barbara College (now UCSB). She came to have a very deep appreciation for Santa Barbara, observing, “In Santa Barbara, there is a cultural atmosphere that one can feel. Santa Barbara is to California what Florence is to Italy. It is the quality that appeals here; not the quantity, for if it is size one wants, there are many places one could live. There is sweetness and peace in Santa Barbara.” In ill health at times, she continued to work, with pencil and paper, on what would be her last book of poetry, Wine Press. She did not speak English, but she read and was a great admirer of Walt Whitman, Ralph Waldo Emerson, and Emily Dickinson, among others. Although she left here in 1948, she retained the house and rented it. After her death on Long Island in 1957, the house passed to her longtime secretary, who continued to rent it out until its deterioration forced demolition in 1980. A hidden legacy of the poet’s was discovered by a UCSB professor in 1965—a cache of manuscripts, correspondence, and notes in the garage. The papers were eventually given to the Library of Congress. Locally, Gabriela Mistral’s memory is enshrined by plaques at Santa Barbara High School and in Alameda Park. 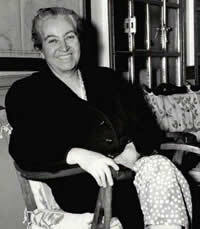 Chilean writer Gabriela Mistral (1889-1957), the first Latin American to win the Nobel Prize for Literature, was a poetic idol for generations of Latin Americans who viewed her as Womanhood incarnate, the national schoolteacher-mother. How this distinctly masculine woman who never gave birth came to occupy this role, and what Mistral's image, poetry, and life have to say about the relations-and realities-of race, gender, and sexual politics in her time, are the questions Licia Fiol-Matta pursues in this book, recreating the story of a woman whose misrepresentation is at least as intriguing, and as instructive, as her fame. 'A Queer Mother for the Nation' weaves a nuanced understanding of how Mistral cooperated with authority and fashioned herself as the figure of Motherhood in collaboration with the state. Drawing on Mistral's little-known political and social essays, her correspondence and photographs, Fiol-Matta reconstructs Mistral's relationship to state politics. Her work questions the notion of queer bodies as outlaws, and insists on the many ways in which queer subjects have participated in and sustained the normative discourses they seem to rebel against. A forceful new view of the complex nexus of feminism and power. 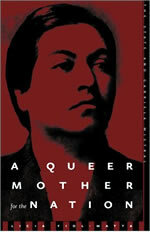 'A Queer Mother for the Nation' weaves a nuanced understanding of how Gabriela Mistral (1889-1957), the first Latin American to win the Nobel Prize for Literature, cooperated with authority and fashioned herself as the figure of Motherhood in collaboration with the state. Licia Fiol-Matta skillfully unpacks the complex strands of the persona constructed by and around Gabriela Mistral-surrogate mother of the Chilean nation, Schoolteacher of America, cosmopolitan defender of human rights, Nobel Laureate, auratic bard, melancholic, closet lesbian a queer-normative complexity ranging across numerous private and public scales, from the remote valley of her birth to the United Nations.